The education secretary, 13 months into her term, was cautious in her first months on the job after a wounding confirmation process and widespread public protests. She largely toed the party line, keeping to Republican orthodoxy that there should be less regulatory interference from Washington, and pledged she’d approve every state plan under the Every Student Succeeds Act that met the law’s minimum requirements without asking for more. Now, though, she’s stopped holding her tongue, offering state education secretaries what she called “tough love” for their failure in her assessment to embrace the law’s flexibility and opportunities to address local challenges. Too many plans “only meet the bare minimum,” and though they may comply with the letter of the law, that doesn’t mean they do what’s best for students, DeVos said. Though governors had the option to formally weigh in on ESSA plans, and many registered their disapproval, it was state superintendents and education secretaries who took the lead on writing them, and CCSSO in defending those efforts. State chiefs emphasized to reporters that they’re undertaking meaningful work beyond what’s written in their formal ESSA plans. “We’re trying to encourage all states to be as creative as they possibly can be to meet the needs of all children …We’re looking way beyond just a simple plan that we’ve put in,” said Carey Wright, the Mississippi schools superintendent and CCSSO president. The required submission templates were minimal, Kentucky Education Commissioner Stephen Pruitt noted. DeVos in one of her first major moves in office scaled back the questions required of states from a more demanding Obama administration proposal. The secretary “can’t get a comprehensive view of what goes on in education in each individual state based on the small template we were given to fill out for the feds,” he said. DeVos took the opportunity to make this statement because all the state chiefs were assembled, she told reporters after the speech, adding that she’d hoped to have more plans approved by now. The department has approved plans from 33 states, the District of Columbia, and Puerto Rico. “My remarks are meant to be an encouragement and an urging to states to continue to work well beyond the plans, to address and meet the needs of individual students and to do so with creativity and with boldness that they might not have otherwise felt the opportunity to embrace because of limitations put on by the department at the federal level,” she said. DeVos did not take questions publicly from the assembled chiefs in what ended up being a distinctly awkward-feeling hotel ballroom, but she met with them privately in a session that was billed to be about school safety issues. The subject has dominated the news since the February 14 school shooting in Parkland, Florida, that killed 14 students and three teachers. Since then, students have demanded stronger gun control measures, such as banning assault rifles, while President Donald Trump has proposed arming teachers. Thirty state education chiefs were at the conference, CCSSO officials said, but they couldn’t specify how many were in the room for DeVos’s address. The CCSSO speech was DeVos’s second unusually pointed address of the year, after January remarks at the American Enterprise Institute where she criticized previous federal reform efforts. In her statement Monday, she dinged states for having confusing annual report cards. She praised Louisiana for using an A–F school grading system, while criticizing an unnamed state that “took a simple concept like a color-coded dashboard and managed to make it nearly indecipherable.” California has faced criticism for doing just that; its plan is still awaiting federal approval. DeVos also said not enough states have asked to be a part of an innovative assessment pilot authorized in the law, or to use part of their federal Title I dollars to provide more course options for students or fund innovative local programs. Though she had few kind words for the state ESSA plans, she didn’t threaten federal action toward those that don’t meet the mark. 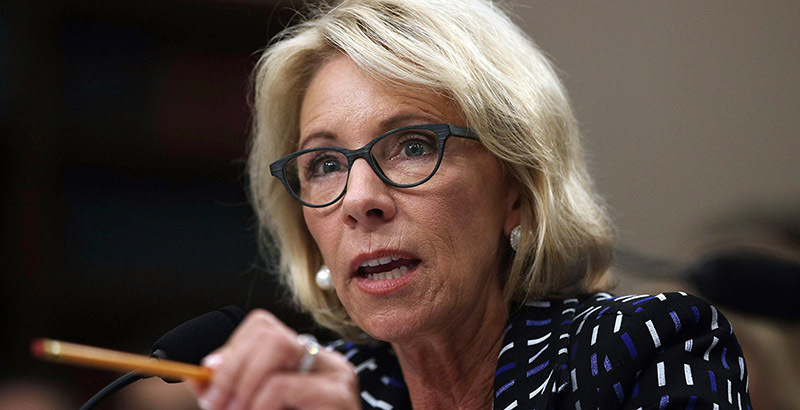 The Education Department won’t “weaponize waivers” (a common conservative criticism of the Obama administration’s approach in the final years of No Child Left Behind) or become the “choice chief” and reject plans that don’t comport with her beliefs, she said. Instead, states should take the lead and find ways to pass increased authority to empower teachers and parents, she said. 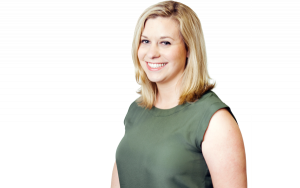 “[My] observation is there are opportunities to be grabbed hold of that aren’t articulated in the plans … I wanted to make sure to communicate that to states, that they have that chance, go take it,” she told reporters after the speech. She ended her remarks with a push for state chiefs to “rethink education,” a theme she has employed for the past several months, including in her first back-to-school tour. “What are you going to do to serve students in your state? Students! Not graduation rates, not a lobbyist’s latest ranking, not a lawmaker’s pet project, no. These are our children we’re talking about. These are their futures, and ours,” she said.